Mikhail Yuryevich Lermontov was Russian poet, writer, dramaturge, painter and officer. Mikhail Lermontov was born on October 15 (October 3 in old style) in 1814 in Moscow. He died on July 25 (July 18) in 1841 in Pyatigorsk. 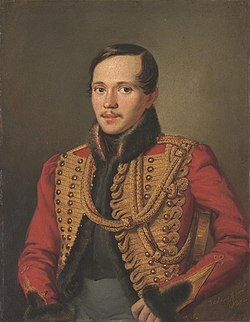 M. Lermontov was born in the family of a captain Yury Petrovich Lermontov and Mary Mikhailovna Lermontova. There was bad situation in his family: his parents sweared each other. Lermontov's mother had died very early and his grandmother became a parent for Mikhail without his father. When Lermontov was a child, he lived on land, which Arseneva held, in the region of Penza. He was studying at home. He knew French and German quite well since he was a child. In the summer of 1825, Lermontov and his grandmother had visited waters of Caucasus. Later, he wrote poems about nature and people of Caucasus like "Caucasus" and "Blue waters of Caucasus, I greet you...". In 1827 his family had moved to Moscow. In 1828 Lermontov had humanitarian education. In 1828-1829 he wrote poems "Corsair", "The criminal", "Oleg" and others. In March of 1830, the Moscow boarding house, where Lermontov studied, became a classical school. In 1830 Lermontov left for a summer classical school. Then he spent time in country Serednikovo near Moscow, held by Stolypins. At the same year poet became a student of a Moscow university. In 1832 he went to Saint Petersburg. He became a student of Nicolay's cavalry college. After he had finished his studying he went to Caucasus. He arrived from Caucasus with lots of poems. Lermontov died in a duel with Martynov Nikolay Solomonovich in Pyatigorsk. This page was last changed on 23 November 2018, at 05:33.